Prince of the Orchards Publications, 9780692084861, 178pp. 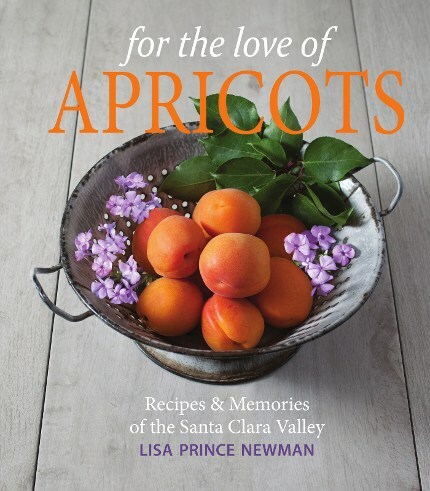 For the Love of Apricots: Recipes and Memories of the Santa Clara Valley is a feast for the eyes as well as the mind. Beautiful food photography blends with images of California’s apricot orchards; from today as well as not so long ago, when fruit orchards covered much of the Santa Clara Valley landscape. Reflections on what the famed Valley of Heart’s Delight was like, how it changed, and what remains, add another dimension to the cookbook. I first want to thank you for writing this beautiful book of your recipes and memories! I grew up in Los Altos Hills in the 60's and 70's, surrounded by a small orchard of apricots. My mom baked every recipe imaginable for apricots and we all loved them dearly! Even our horse, Miss Clara, who had one apricot tree in her coral, ate the fruit she could reach and, believe it or not, spit out the seeds! I have longed to find a recipe for apricot bars that is as good as my mom made, and have high hopes, that the recipe for bars mentioned in the newspaper article about you and your book, will be "it"! I ordered your book yesterday and look forward to receiving it and start baking! Thanks again! All the best to you! I just received For the Love of Apricots and I really love the book! I've made three recipes in just a few days -- the Apricot Dutch Baby, the Grilled and Curried Shrimp, and the Canapes. They were all delicious and the recipes were well-written and easy to make! I collect cookbooks (I have over 1,300) and I think you did a great job. I want to make all the recipes and the story of the transformation of Santa Clara Valley is really compelling. I grew up in the Bay Area and it has been heartbreaking to see how the valley and San Francisco have changed. I so appreciate that you wrote this book and told the story. It is a treasure and I'm so happy to add it to my collection! I walked into Andy’s Orchard store today to pick up some cherrries and saw your cookbook “For the Love of Apricots” on the shelf. As a docent for the Morgan Hill Historical Society I always love picking up new local books, so I took a copy home with me. Although I haven’t even cooked any of the amazing looking recipes, I just had to let you know that your book makes my heart sing. It is such a wonderful ode to the history of this Valley, and I will be gifting copies to family and friends far away so that they can finally understand why I love living next to the orchards in Morgan Hill so much. Thank you for publishing such a treasure, and I wish you great success with it!